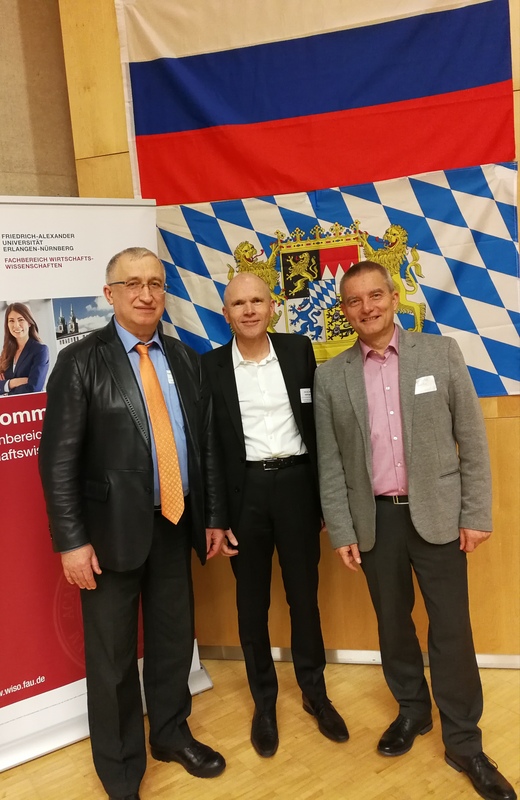 On November 9/10 the International Association of Controllers (ICV) was guest at the Bavarian-Russian Conference Economic Sciences with 180 German and Russian participants in the Department of Economics of the Friedrich Alexander University of Erlangen -Nuremberg. Bavarian and Russian universities currently have more than 100 partnerships. Two Russian work groups work in the ICV: in Kaliningrad, and in Moscow the joint work group with the German-Russian Chamber for Foreign Trade. Up to now, the university cooperations have been running mainly in technical or scientific fields. Now they are to be extended to business, economics and energy economics, explained conference chairman Prof. Dr. med. Dirk Holtbrügge (in the middle), Chair of International Management, Dean of International Affairs, Faculty of Business and Economics, FAU. According to Prof. Holtbrügge, there are currently 5,500 companies with German interests in Russia. With the work group Moscow, which was founded a year ago in cooperation with the German-Russian Chamber for Foreign Trade and the ICV, the Chamber for Foreign Trade and the ICV member companies can now offer employees of Russian subsidiaries or holding companies from the areas of controlling and accounting a platform for know-how transfer, networking and the exchange of experience,. The common intention of Chamber and the ICV is to make a contribution to the personal success of their members and the sustained increase in the value of their companies. At the symposium in Nuremberg, Hans-Peter Sander (on the right), Head of the ICV Team PR / New Media, met with the chairman of the Russian Controller Association, Prof. Dr. med. Dr. habil. Sergey Falko (on the left), Head of the Department of Business Economics and Production Organization of the Bauman Moscow State Technical University. The ICV and the Russian Controller Association have been cooperating for several years. Prof. Falko supports the young WG Moscow since its founding. In his presentation at the Nuremberg conference, Prof. Falko also acknowledged the long-standing cooperation with the ICV, which helped to prepare a very good bachelor and master controlling program at his university. The two-day meeting of the Bavarian and Russian economists, in which universities of both countries presented themselves with interesting projects, showed one of many cooperation examples: There is great interest in more intensive cooperation on both sides – from joint research projects to student and academic exchange. Widespread contact is sought with companies for graduation projects or internships. In Nuremberg in numerous discussions the ICV drew attention as an international network of experts in the field of controlling.